There isn’t much that distinguishes Melania Trump’s recent Africa type trip to the continent from previous ones of other Western celebrities or VVIPs. The right photo-ops have of course been taken—solemn photos in the shadows of Ghana’s slave castles, adorable moments with baby elephants in Nairobi, kissing African babies, and being pictured with as many African children as could be squeezed into such a quick trip. We Africans have watched from the sidelines with mild amusement or a complete disinterest as we play along with the whole performance wondering what the purpose is. The most newsworthy item of the whole trip though was the US first lady’s “colonial chic” safari outfit that she donned in Kenya (white shirt, jodhpurs, riding boots and of course the offensive pith helmet.) With not much by way of content to inspire the African and international media, some have focused on the ambivalence about her trip. Another key question among fellow Africans I’ve spoken with has been—what was the purpose of her trip? And who was the intended audience? No one seems to know. With little else to talk about, most of what has been written about her trip focuses on her fashion choices. Perhaps though, this is a moment to focus on the complete irony of this trip in the light of what the Trump administration represents and does. Melania Trump visited quite a few countries that were definitely on her husband’s list of shithole countries. As she lays a wreath at the slave castle in Ghana promising never to forget the hardships of slaves who were shipped across the Atlantic, Trump continues to attack their descendants when they kneel during the national anthem during football games to protest against police brutality, particularly toward African Americans, and racial oppression. As the first lady gets playfully bumped by baby elephants at the elephant orphanage in my hometown of Nairobi, one can’t help but contrast this with the president’s own sons (Donald Trump Jr and Eric Trump’s) hunting trips to Africa where they get to bump off some wildlife. It also doesn’t help matters that the Trump administration recently lifted an Obama-era ban on elephant trophy imports from Zambia and Zimbabwe. With her final stop in Egypt —one of the African countries with the highest Muslim populations, one cannot help but think of her husband’s Muslim ban. As Mrs Trump kisses and hugs black and brown children, one contrasts this scene with that of the Trump Administration taking brown children from their families at the US borders. On a recent visit to Lagos for a fashion show, veteran supermodel Naomi Campbell called on leading global fashion magazine to start an Africa edition and it’s sparked a bit of debate in Africa’s fashion circles about whether the region really needs Vogue or if Vogue needs Africa. There’s also been some talk about Africa designers and followers doing more to support homegrown fashion publications. 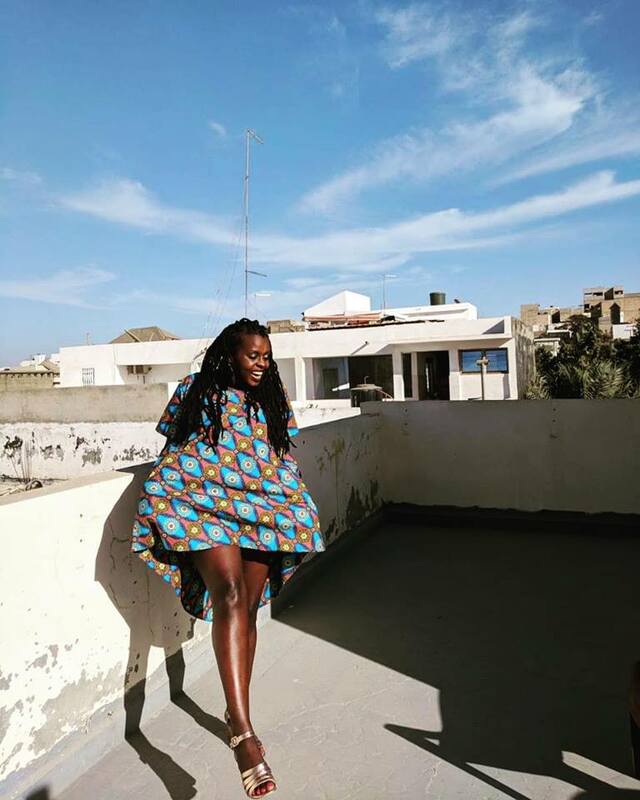 One thing that people on all sides of the debate seem to agree on though is that fashion in Africa is a vibrant, diverse space that does not get enough recognition for how it has influenced global trends. Those who are for Vogue starting an Africa edition believe that it will give the continent’s fashion industry the global visibility it deserves to foster its growth. Those who are apprehensive about the move fear that Vogue will represent African fashion in a way that only exoticizes and fetishizes African fashion but to the benefit of the West without any real benefits accruing to the cultures and designers who have been responsible for creating and growing Africa’s fashion legacy. Either way, Vogue would be playing catch-up as African fashion is alive, well and constantly reinventing itself. All one needs to come to this conclusion is simply walk through the streets of Dakar, Addis, Lagos, Nairobi or Accra or “visit” them on Instagram. The appeal of the fashion publication that Anna Wintour revolutionized and the fact that Vogue UK now has a British-Ghanaian editor (Edward Enninful) who is keen to diversify the publication—and in fact masterminded the 2008 all black Vogue Italia top-selling edition—might still not be enough reason for us to believe that a Vogue for Africa is what we need. Check out my full article for Quartz Africa here. I had spent close to a week in Bangladesh presenting and participating in the Dhaka Literature Festival in November 2015. After the trip I took a few days off to tour Singapore and Malaysia—both of which I fortunately did not require a visa in advance. My return flight to my hometown, Nairobi, would transit through Istanbul. There was an unavoidable 24-hour layover that the airline would compensate me for in the form of a five-star hotel room during my long wait. I got to Istanbul—exhausted and eager to get to my nice cozy hotel room, shower, and sleep off my jetlag before my long trip to Nairobi. I am a Kenyan citizen. Uhhmm. No. I am generally issued 10-day visas, two-week visas, one-month visas for certain countries if I am very lucky. The next message on the screen read, “Unfortunately you are not eligible for a transit visa.” Just like that, I realized that my Turkey experience would be lived at the airport. I got back to the information counter sad at the realization that a valid Chilean visa was more readily accepted than my Kenyan passport. It made me think of all the indignities I and so many other Africans suffer at the hands of immigration officials. Full article available on Quartz. Dancefloors all over the continent are rocking to a new beat – unlike that of previous decades, this new sound is a homegrown one. Africans are increasingly listening to and dancing to African music. What makes this trend even more exciting are all the cross-country collaborations that are bringing musical genres and cultures to other countries. Whether it is Angolan zouk kizomba dance classes in Accra, Kenyan comedians speaking in Nigerian pidgin or Anglophone/Francophone collaborations, one thing is clear – our music is traversing borders in a way that our people might not yet be able to. In Francophone Africa, there is no ignoring the power and influence of Ivorian Coupé-Décalé. A literal translation of Coupé-Décalé is “to cheat” and “run away.” Having originated in Parisian night clubs in the early 2000s, brought to the French capital by Ivorian DJs, the music initially celebrated Africans who were living the migrant dream, they had struggled as most migrants do and eventually make it - many times through illegal means. The popularity of the music grew at the time of the first Ivorian Civil War (20002 – 2007) when a dispirited population needed to believe in the migrant dream – of escaping challenges back home and finding fame and fortune abroad. Coupé-Décalé is extremely percussive featuring deep bass and repetitive minimalist arrangements. Vocals of most songs are usually about looking forward to a better future (e.g. Oudy 1er’s“Never give up”) about enjoying life despite its challenges (e.g. Molare’s “Sauvagement”, “Tu es fou elle est folle”), about an ideal pan-African existence (e.g. Serge Beynaud’s “okeninkpin” and “Kababléké”) and to a lesser extent about making money and living thegood life (e.g. Jodi’s “Beaucoup d’argent”, Dj Arafat’s “Gbinchin Pintin”) – this is in contrast to Nigerian afrobeats where the theme of making and “chopping” money seems to be more central to the theme of enjoying yourself, dancing, letting loose etc. In Ivorian Coupé-Décalé it is clear that dancing comes first, the popping of champagne bottles, the expensive cars and the fancy houses are merely a backdrop for the enjoyment. When it comes to lyrics, Coupé-Décalé favors simple repetitive lyrics that match well to a dance. There is also an acceptance of a variety of voice types (almost mostly male)– from the raspy sounds of Dj Arafat and Debordo Leekunfa (“Shake your body”, “Apéritif yamoukidi") to the harmonious melodies of Serge Beynaud (“Talehi”, Mawa Naya” “C nous les boss”,) Shado Chris (“J'S8 Jahin Pret”) and Bebi Philip (“Move”, “Balaumba”, “On Va Piétiner”). Most Coupé-Décalé songs have a unique dance that quickly spreads throughout clubs in Abidjan and eventually to other cities. It is a typical sight to have hundreds of people all lined up in a club in Abidjan facing the mirror (as most people dance facing a giant mirror on the dancefloor) dancing for hours to a Coupé-Décalé set in perfect harmony. Coupé-Décalé is to be danced to and lyrics such as “Bougez/move”, “Levez les mains/raise your hands”, “Avancez, Reculez/ Move forward, Move back,” are quite common. Though extremely quick dance music dominates the Coupé-Décalé scene, special mention must be given to artists who are challenging the status quo. Female musician Josey is managing to get continuous airplay with her slower catchy tunes mostly focusing on love and heartache (“On fait rien avec ca”, “Diplome”.) One thing is for sure – Coupé-Décalé will make you dance – whether you understand the lyrics or not. From Lusophone Africa (Portuguese speaking countries) – Zouk Kizomba is working its way across African dancefloors and radio stations. Dominated by artists from Angola and Cape Verde, this sweet, seductive sound is winning converts, even if only a small fraction of the continent speaks Portuguese. Kizomba is the evolution of an Angolan dance genre from the 1950s – semba and its marriage with a Cape Verdean musical genre – Passada. Cape Verdean immigrants to France in the 1980s encountered Compas – a musical style from Dominica, French Antilles, Martinique and Guadeloupe. They incorporated its beats and rhythms to it and this musical genre got imported back to Cape Verde – not difficult to do for a country where more of its citizens live outside the country than inside it (Cape Verde.) The music spread through Portuguese speaking countries and when it made its way to Angola, it had the effect of slowing down the tempo of semba dances. Today this musical genre is famous in lusophone Africa and beyond and goes by various names including zouk kizomba, kizomba etc. Stylistically kizomba has a slow, insistent, sensuous rhythm created via electronic percussion. It is danced accompanied by a partner, very smoothly, slowly and sensuously. There are frequent simultaneous hip rotations between dance partners, particularly in the quieter refrains of the music – and quiet refrains are quite common in kizomba. This is a dance for lovers. The main theme of zouk kizomba is love, longing and loss. Contemporary kizomba musicians and songs to watch out for are: Cape Verdean, Netherlands based musician Nelson Freitas (“Rebound chick”, “Miúda Linda”, “Something good”, “Simple girl”), Angolan C4 Pedro (“Bo tem mel”, “African beauty”, “Spexta one”, “Robocop”), Congolese Kaysha’s kizomba remixes of US hits (“Diamonds”, “Drunk in love”, “All of me”), Cape Verdean, France based Jennifer Dias (“Sorry remix”, “I need you so”, “Viens danser”, “Reste avec moi” and “Femmes Fatales 5”.) You will definitely fall in love with kizomba and its enchanting beats and the angelic voices behind the music. Last and definitely not least is music from Anglophone Africa. Nigerian afrobeats has taken over the continent resulting in several cross-country collaborations (J. Martins featuring Dj Arafat “Touchin Body”, Diamond featuring Davido, “Number one”, Diamond Platnumz Ft Mr Flavour “Nana”) and interesting remixes that cut across language barriers. Modern day Nigerian afrobeats clearly marks the country’s cultural dominance on the continent. First Nollywood, now the music – Nigeria is quickly determining what is considered as contemporary African culture. The influence of contemporary Nigerian music has gone even beyond African borders to the West. D-Banj’s “Oliver Twist” and “Fall in love” are as much at home in clubs in Lagos, Kampala and Durban as they are in London, Boston or Amsterdam. Davido & Meek-Mill’s (“Fans mi”), P-Square and Rick Ross’ (“Beautiful Onyinye”) – Afro-beats, hiphop collaborations are now becoming commonplace. Beyond the Africa Visa country openness index – what are the barriers to Africans traveling to other African countries? The African Development Bank (AfDB) recently put out an Africa Visa Openness report – the first of its kind – assessing how easy it is for African travelers to visit other countries on the continent. For me, this report could not have been more timely. I am a Kenyan citizen. At the time I was in Ivory Coast jumping over very many huddles as I tried to obtain the necessary visas that would take me on a road trip from Abidjan to Bobo and Ouagadougou in Burkina Faso, to Lome in Togo, to Cotonou and Ouidah in Benin and finally get me back to Abidjan in good time to catch my flight back to Nairobi. I cannot fully explain the incredulous looks on the visa officers’ faces when I said I was not visiting friends or family in those countries but simply traveling as a tourist. “Then you need to show us confirmed hotel bookings if you cannot provide all these documentation from your host.” At this point I should mention that not only was my non-existent “host” in those countries required to send me an invitation letter, proof of their residency in the country, but these documents had to be signed and stamped by a high ranking police officer based in their home area. I wondered, “Hotel bookings? I am traveling by bus, how could I possibly know what exact dates I will get to these cities, how long I will stay etc.” I definitely did not mention I was planning to couchsurf in the different cities. I quickly learned that as an African traveler that there is no room for spontaneity – when traveling you need to have every single aspect of your trip planned. While the requirement of having a visa and all the documentation that needs to be provided is highly restrictive, I chose to focus on additional factors that would make a middle class African more willing to go to Dubai, London or Paris on vacation rather than immediately thinking of going to another African country. This is a great loss to the continent as it means collectively we are not yet benefitting from the “Africa rising” rhetoric if huge proportions of tourist spending is not used within the continent. Duration of visas – Most African countries are still only willing to give one month single entry visas to other African visitors (with a multiple entry visa for that same time-frame almost being twice as expensive.) Given all the hurdles one has to cross to obtain some of these African visas, the least that can be expected is not to have to go through the same process every time someone travels to the same country again. Ambiguity of visa processes – Google any telephone number for an African country you know little about, but would really love to travel to. It is highly likely you will not find contact details for their embassy in your country (perhaps they do not have an embassy in your country.) If they do have an embassy in your country, it is very likely their website was last updated before the new millennium. Try calling the number on the website and it will likely not go through or you will get a message that the number no longer exists. Send an email to the general email address on the site and it will likely bounce back. You will have to go in person and even then you might arrive and have the guard tell you they only open on Tuesdays and Thursdays from 10am – 2pm. Eventually you might give up and decide to travel elsewhere. Inflexible bureaucracy – Many times the consulates have a check-list that they will not make any compromises on. When applying for my Beninois visa at the consulate in Abidjan, they needed my airline ticket. I told them I would be traveling by bus and they asked for my bus ticket. When I mentioned that would be the 5th or 6th long distance bus of my trip – and as such I did not yet have it and would have to book it along the way, they insisted I purchase my first bus ticket (Abidjan to Bobo in Burkina Faso) and bring it to them before they could process my application. How does me having a bus ticket from Ivory Coast to Burkina Faso, prove I won’t disappear in Benin? I’m not quite sure, but they somehow think it does. The remaining set of factors, I describe as the chicken and egg factors. Perhaps they are the way they are because there is not enough intra-African traffic moving between the countries, or perhaps there is minimal intra-african traffic because of these factors. Flight costs – It is sometimes said as a joke, but at any given point it is much cheaper (50-70% cheaper) to fly to Europe, the UAE and sometimes North America than it is to fly within the African continent. A quick internet search for flights, and you will find return flights at over $1000 from Nairobi to Maputo, over $1200 for Nairobi to Dakar, Nairobi to Zanzibar $300. A similar search for flights and you will find return tickets from Nairobi to Dubai for $350, Nairobi to London - $600 and Dakar to Paris - $600. Coupled with the visa challenges, it is easy to see how even well-traveled Africans might just not be well-traveled on the continent. Traveling round our own continent is a labor of love. Shortage of tourist facilities – While tourist facilities are really well developed in some African countries, the reality is that in others they are severely lagging behind. It is not surprising given some of these countries have not historically been seen as tourist attractions and have rarely been visited by tourists. In many cases the main interactions such countries have had with foreigners is with aid workers, NGO employees etc. As such a tourism industry has not developed – facilities will be poor and overpriced in many cases. If it was however easier for people (including Africans) to travel to such countries, one can envision a scenario where an entrepreneur would then put in the necessary facilities to attract tourists. Even if one is trying to travel cheaply and stay in hostels, you quickly realize that “hostel” in Africa is rarely synonymous with hostels in other regions that have a backpacking culture – Europe, South America and Asia. It is noteworthy though that even in the most challenged of African countries, there is likely natural beauty, history and culture around which a tourism industry could be developed. A few years back I spent a few weeks in the Comoros Islands. I was equally amazed by how beautiful the country was, how unique the culture was but also dismayed that this country that could likely be compared to Seychelles in natural beauty, is one of the poorest in the world. So what are the solutions? The African Development Bank report states them well: (i) Visa on arrival for Africans – Progress is being made in some countries e.g. from last year Kenyans are able to get a visa on arrival in Lagos for $25. (ii) Visa free regional blocs – Those largely exist in SSA in West Africa (ECOWAS), East Africa (EAC) and Southern Africa (SADC). The next step after this is moving to reciprocity for regional blocs – essentially if all one needs is a single visa to enter ECOWAS region even if from a different region e.g. EAC or SADC, this would greatly improve the current system. If another African travels to East Africa shouldn’t they be able to go the Maasai Mara in Kenya, visit the island of Zanzibar in Tanzania, attend a gorilla naming ceremony in Rwanda and swim in Lake Tanganyika in Burundi all on the same visa? The Schengen visa is a model we can build upon – thinking as a region rather than as a country. (iii) Multi-year visas – 5-10 year visas requiring the candidate to leave every 6 months or so would go a long way in encouraging repeat trips. Even at a substantial cost, many would be willing to forego all the hassle of applying for visas to the same countries every few months. (iv)Promoting positive reciprocity and opening up on visas unilaterally – Several African countries have already taken this up and we should see it happen on a larger scale. Seychelles offers visa free travel to all African citizens. Senegal recently got rid of visa requirements for most nationalities. Rwanda is one of the two most visa open countries in Africa (second to Mauritius). The effects have been positive with increased trade, tourism and investment in the past few years. GDP growth increased to 7% in 2014 and tourism revenues rose by 4% to USD 305 million. In 2013, the Kenyan President Uhuru Kenyatta announced that Kenya would eliminate visas for African states on a reciprocal basis and there has been progress on this. (v) Simplifying visa processes and (vi) Improving access to information online and in different languages. The continent needs to capitalize on ways to increase intra-african travel with the aim of fostering unity and understanding and increasing trade and investment. On the demand side, there is no shortage of Africans who would love to see our continent with our own eyes.